Richmond, BC – 35 athletes between the ages of 15 and 22 tested their capacity for sport performance at its highest level as part of the Canadian Sport Institute Pacific’s PODIUM SEARCH on Saturday, May 31 at the Richmond Olympic Oval. This is the third year for the PODIUM SEARCH initiative but the first time the event has been hosted on the lower mainland. PODIUM SEARCH is a free half-day athlete identification camp designed to provide athletes with an introduction to the high performance sport environment. 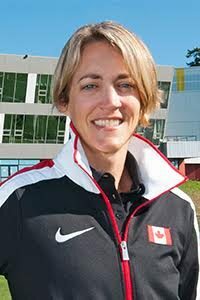 In addition to the testing events, athletes heard an inspirational address from keynote speaker Ben Rutledge, 2008 Olympic gold medallist in rowing. Four of the 35 athletes in attendance were vying for the attention of a Paralympic sport. The attendance of these four parasport athletes is thanks to the deliberate re-focus of the high performance sport strategy for parasports that has been taking place across the country and in the province of BC. PODIUM SEARCH is the result of powerful partnerships between the Canadian Sport Institute Pacific and our National and Provincial funding partners in concert with various National and Provincial Sport Organizations. “Helping to develop our future Olympic and Paralympic hopefuls is something the Government of British Columbia takes great pride in. PODIUM SEARCH camps are a great way to identify local talent and give our athletes the opportunity to train for competition at the highest possible level. Events like this are not just about sport, they are about creating legacies and strengthening communities,” said Coralee Oakes, Minister of Community, Sport and Cultural Development. Athletes who participated in PODIUM SEARCH will be evaluated for possible selection for Canadian Sport Institute Pacific’s Sport Programs based on their test scores during the camp. The next PODIUM SEARCH is planned for September 2014 in Whistler.